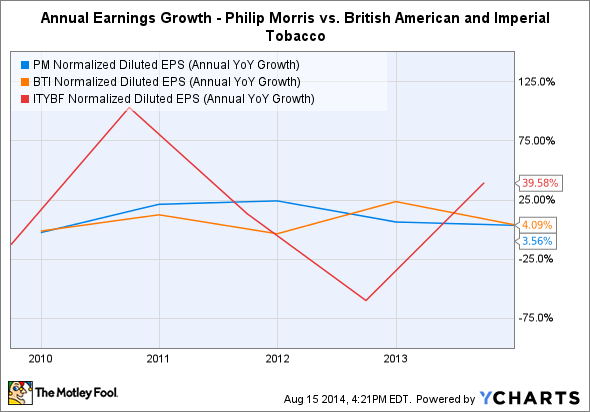 Is It Time to Buy Philip Morris International Stock? With merger activity in the domestic market, is international tobacco the place to be? The tobacco industry has been a very profitable space for investors over the long run, and shareholders in Philip Morris International (NYSE:PM) have been quite pleased with the international tobacco giant's results since its spinoff from former parent Altria Group (NYSE:MO) in early 2008. But after more than doubling between its 2009 lows and early 2012, Philip Morris stock has stagnated, paying dividends to its patient shareholders but raising questions about its future growth. As regulation and other headwinds start to buffet the worldwide tobacco market, some investors wonder whether now is a buying opportunity for Philip Morris International or whether further problems are ahead. Let's take a closer look at Philip Morris International to see what prospects the stock has in the immediate future and over the long run. One of the purposes of Philip Morris International's spinoff was to give investors a chance to cash in on what was perceived as greater growth potential from the international tobacco market. In the U.S., a combination of increased regulation and greater activity to encourage people to stop smoking made many doubt whether the domestic tobacco market could ever produce sustained growth again. By contrast, less regulated areas of the world, especially rapidly growing emerging markets, provided Philip Morris with the opportunity to capture much faster growth rates. As a result, valuations initially reflected those expectations, with Philip Morris fetching a higher multiple than Altria and other domestic tobacco companies. PM P/E Ratio (TTM) data by YCharts. More recently, though, Philip Morris has started facing many of the same challenges that Altria and other U.S. tobacco companies have had to deal with. Several nations around the world, including Australia and the U.K., have imposed restrictions on tobacco sales and limitations on cigarette packaging that in some cases are even more draconian than what consumers see in the U.S., and investors have responded by discounting Philip Morris International's earnings multiple to levels below what Altria currently fetches. Does Philip Morris International still lead the industry? Most U.S. investors compare Philip Morris to its domestic counterparts, even though for the most part they don't directly compete against each other. With the coming merger of Lorillard (UNKNOWN:LO.DL) and Reynolds American (NYSE:RAI), the U.S. tobacco market will largely be a fight between the newly merged entity and Altria, and both of those players will concentrate primarily on their domestic operations. But Philip Morris does have international competition from British American Tobacco, Imperial Tobacco, and other companies worldwide. For the most part, Philip Morris has been able to hold its own in growing earnings, with solid and dependable growth rates over the past several years. Yet more recently those growth rates have slowed, and the specter of competition weighs more heavily on investors. PM Normalized Diluted EPS (Annual YoY Growth) data by YCharts. Still, Philip Morris International's most recent earnings show the struggle that the tobacco giant has had to face. The company did better than investors had expected, with solid pricing and gains in overall market share helping to keep drops in revenue to a minimum. Yet sales volumes are still falling around the world, with quarterly shipments falling 2.7% from year-ago levels. Moreover, with more governments looking to impose regulatory restrictions on tobacco, the future growth picture for Philip Morris looks increasingly cloudy. That's a big part of why the company cut its full-year earnings guidance for 2014, and although currency effects also played a role, weakness in European and Australian sales will prompt factory closings. That said, Philip Morris still believes that it has a commanding presence in the international tobacco market, sporting 15.7% of non-U.S. sales. When you exclude the tightly controlled Chinese market, Philip Morris' share jumps above 28%. That market share gives Philip Morris some advantages of scale over smaller rivals, and reflects the continuing popularity of its brands. 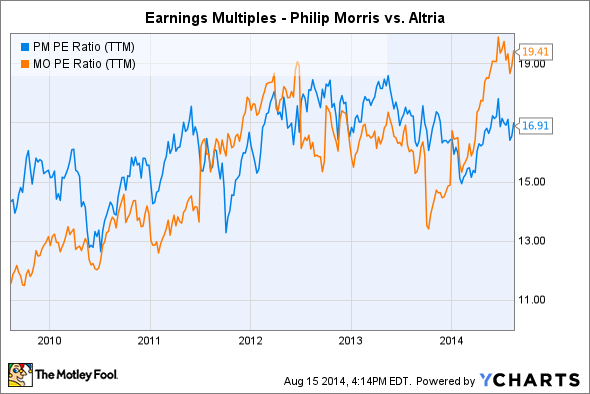 Is Philip Morris International a good buy right now? The long-term fundamentals of the global tobacco business aren't likely to change in the near future, so investors shouldn't expect a quick payoff by buying Philip Morris International stock right now. But with a better than 4% dividend yield, investors receive some incentive for their patience. If new initiatives like the electronic cigarette market start to bear fruit, then investors will look back in hindsight at today's share price for Philip Morris as a strong opportunity.